Max and Caroline’s wedding was all about throwing a huge party, being themselves, and creating everlasting memories together. The day started with Caroline getting ready with her bridesmaids as they helped her into the Amelia gown, customized with a lace-up corset back. With all the textured beading and dress details, a natural hair and makeup look was all Caroline needed to make her beauty stand out. The couple’s first look and bridal portraits took them through the quaint streets of Covington, then it was on to a sweet and emotional ceremony. Finally, it was time for the wedding reception to begin at the Leapin Lizard Lounge, where the bride and groom looked like they had the time of their lives surrounded by friends and family. It reminds us what a wedding is all about, celebrating good times with those you love and letting your personality shine through! Michigan might be known for its cold winters, but that didn’t stop Maire and Tyler from braving the cold to capture some of that snowy magic and make it part of their big day. You’d never guess that it was 11 degrees outside from the joyful looks on their faces! Maire’s bridal style was perfectly laid back with natural makeup, a wispy braided bun, and minimal accessories to let her natural beauty shine through. All of the personal touches spoke to the bride and groom’s adventurous spirit. The silk chiffon on our Stella gown was just perfect to blend into the snowy landscape. It even looked great with some Bean Boots and chunky knit mittens so don’t be afraid of a little snow on your wedding day! The majestic scenery of the Bavarian Alps were all the “details” that Melissa and her husband Shane needed to create the perfect wedding ceremony just for the two of them. The couple took their vows in front of Lake Eibsee, with the sweeping mountain range as the only backdrop. Melissa kept her bridal look classic and laid back with our tulle Victoria gown, while adding drama with a long chiffon cape. It’s amazing to see a beautiful and adventurous couple venturing out to create amazing life long memories! There’s nothing like seeing a bride radiant with joy on her wedding day! Aimee chose our Victoria gown, which perfectly suited the relaxed lakeside setting on Lake Michigan. Every detail was perfectly thought out to create a cozy and intimate atmosphere. We especially love the personalized cake topper, what a great way to include the third family member! When it came to accessories, Aimee kept it simple to bring out her natural beauty. All you really need is a classic veil and some great florals! The coral roses were a great compliment to the blush bodice. As the night got a bit chilly, a wrap around cardigan transformed the dress into a second look, perfect for enjoying the sunset along the shore. 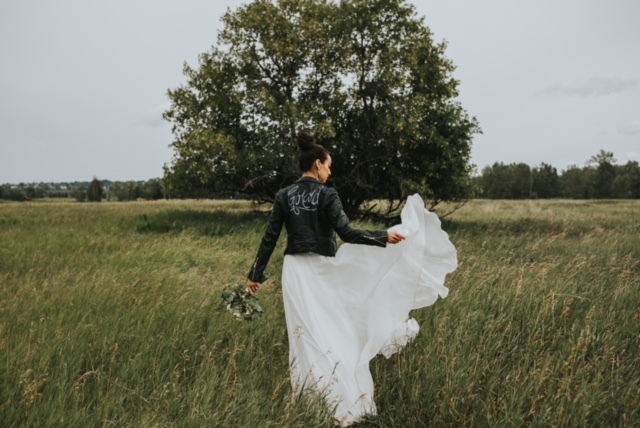 It's rare to see a bride combine everything we love so much in a single shot... an open field, wind swept skirt, and a leather moto jacket. 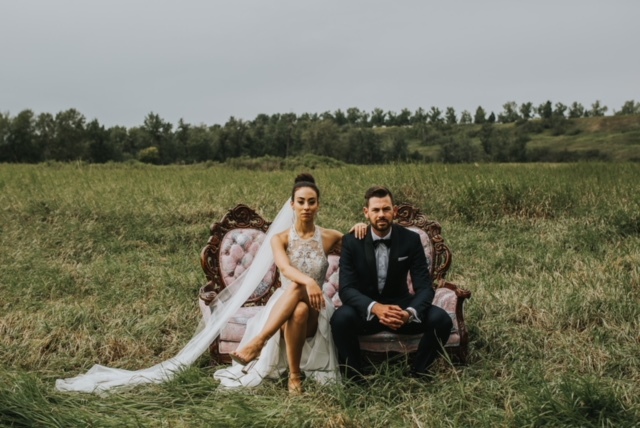 Janelle chose the Maya gown at our Calgary, AB stockist, Blush and Raven, and totally made it her own. Her fearless bridal style came through in her pairing of the flowing silk chiffon skirt with some killer Cinderella heals and a hand painted leather jacket, a DIY creation. As the wind picked up, Janelle and Lisa of Mint Photography captured some epic shots of the chiffon skirt blowing in the breeze, making the less-than-perfect weather work to their advantage. And the "something borrowed"? Her grandmother's vintage couch! Placed in the open field of Calgary's Meadow Muse, it added some dramatic flare to the bridal portraits of Janelle and her hubby. These two make quite the stylish couple! "The day was filled with so much love and happiness and dancing- So. Much. Dancing!!! It was a truly magical day, we couldn’t have asked for anything more!